A European team of scientists have built the first atlas of white-matter microstructure in the human brain. The project's final results have the potential to change the face of neuroscience and medicine over the coming decade. The work relied on groundbreaking MRI technology and was funded by the EU's future and emerging technologies program with a grant of 2.4 million Euros. The participants of the project, called CONNECT, were drawn from leading research centres in countries across Europe including Israel, United Kingdom, Germany, France, Denmark, Switzerland and Italy. The project investigators met today in Paris, after 3 years of research, to announce the conclusion of the project and present a report of their findings. The new atlas combines three-dimensional images from the MRI scans of 100 brains of volunteers. To achieve this, CONNECT developed advanced MRI methods providing unprecedented detail and accuracy. The UCL team use the latest computer modelling algorithms and hardware to invent new imaging techniques. The techniques we devised were key to realising the new CONNECT brain atlas. Professor Daniel Alexander, a CONNECT steering committee member from the UCL Department of Computer Science said: "The UCL team use the latest computer modelling algorithms and hardware to invent new imaging techniques. The techniques we devised were key to realising the new CONNECT brain atlas. "The imaging techniques reveal new information about brain structure that help us understand how low-level cellular architecture relate to high-level thought processes." Currently, biomedical research teams around the world studying brain science rely on a brain atlas produced by painstaking and destructive histological methods on the brains of a few individuals who donated their bodies to science. 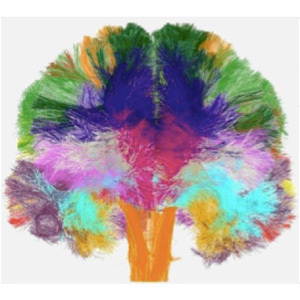 The new atlas simulates the impossible process of painstakingly examining every mm2 of brain tissue (of which there are around 100 million per brain) with a microscope, while leaving the brain in tact. The key novelty in the atlas is the mapping of microscopic features (such as average cell size and packing density) within the white matter, which contains the neuronal fibres that transmit information around the living brain. The results of the project, obtained through advanced image processing techniques, provide new depth and accuracy in our understanding of the human brain in health and disease. The atlas describes the brain's microstructure in standardized space, which enables non-expert users, such as physicians or medical researchers, to exploit the wealth of knowledge it contains. The atlas contains a variety of new images that represent different microscopic tissue characteristics, such as the fibre diameter and fibre density across the brain, all estimated using MRI. These images will serve as the reference standard of future brain studies in both medicine and basic neuroscience. The project will dramatically facilitate and promote future research into white matter structure and function. Historically in neuroscience, the vast majority of research effort has been invested in understanding and studying gray matter and neurons, while white matter has received relatively little attention. This owes largely to the lack of effective research tools to study white matter, even though it comprises about half the volume of the brain. The new MRI methods that were developed in CONNECT allow researchers, for the first time, to visualize the micro-structure of the living brain over the whole brain. This opens new realms in our understanding of our most complex organ. In the future, the project members intend to use the technology they have developed to study the dynamics and time dependence of the micro-structure in white matter. For example they will search for a finger print or a trace that a cognitive task imprints on white matter microstructure encoding new experiences in the wiring of the brain. Another future direction is to characterize and understand micro-structural changes caused by different neurodegenerative diseases, such as Alzheimer's or schizophrenia, in order to develop better diagnostic procedures for these and other devastating conditions.